This year continues to be a strong year for Intervals. Our customers are currently using Intervals to manage more than $330 million dollars worth of work throughout 90 countries. And we’ve been seeing a significant increase in signups. We remain dedicated to our ethos of constantly evolving Intervals based on customer feedback, and have been hard at work improving Intervals with new features and performance optimizations. Here are some recent updates we’ve made to Intervals. Many of our customers have told us it would be ideal to view and sort by the client name on the weekly timesheet. We agree. We discovered that many companies will use similar project names, differentiating them from one another by the client name. You will notice now that client names are included on the weekly timesheet, as is the ability to sort by them. 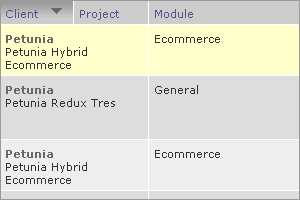 In addition, we have layered client names into project lists when generating invoices and uploading documents. 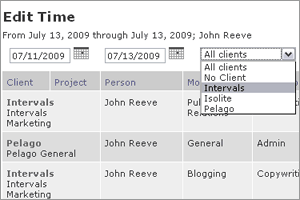 Future Intervals updates will include further incorporation of this client attribute. Thank you all for your input on this improvement. We know you will find it useful for understanding better where your time is going. There are some task attributes, such as milestone, module, and assignee, that are unique to each Intervals project you are managing. And previously, these task attributes could not be updated en masse due to potential project conflicts. We’ve resolved this issue by including additional task update options when filtering a task list by project. The next time you need to move a bunch of tasks from one milestone to another, or reassign them from one person to another, filter your task list by a project and update several checked tasks at once using the “with selected…” menu. This improvement comes on the heels of another less broadcasted feature, the multiple task updater. 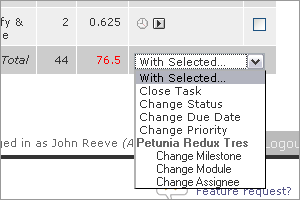 To update several tasks at once, check all those that apply and then select your next action from the “with selected…” dropdown menu at the bottom of the task list. Use this option to quickly close tasks or change priority, due date, and status. If you’ve never noticed the Edit Time page under the Time tab before, it’s time you did. This page allows you to quickly drill down into past time entries and edit them. And because time entries can accumulate over time, the menu of filter options is smart enough to only present you with options that will result in editable time entries. We wanted to avoid you having to repeatedly be shown the “zero results found” screen when trying to find that one time entry. As you change the date range and other dropdown menu times, your selections will cascade and filter the remaining options to the right, showing you only valid options that will result in one or more time entries when clicking the Filter button. Not only does this feature help you find time entries faster, it makes editing them faster as well. The team behind Intervals is constantly researching and implementing enhancements into Intervals. Most recently, we’ve made performance enhancements to the task views and updates, making adjustments that should make Intervals noticeably faster. As always, we are committed to continuing to find ways to improve Intervals and make the user experience faster. We’ve also completed our infrastructure overhaul, adding more servers for additional redundancy and upgrading server software and hardware for greater speed and performance. Meanwhile, we are continuing to work on a few significant performance enhancements that we’ll be rolling out over the next few weeks. In addition to the updates mentioned above, we have been layering in other small changes throughout the application. For example, the project activity report now includes project fees. And we plan on making project fees more integrated with reports for those of our customers who track expenses and time. However, we have more than just small changes in the works. Our roadmap for the third quarter of 2009 includes some substantial features. First up is our API, followed by a QuickBooks time export and client contact management. Read more about our upcoming features in our forum, and feel free to weigh in with your comments and suggestions. One percent of our revenue is going to aid environmental efforts. Intervals is a contributing member to One Percent for the Planet. This year’s contribution is again going to the Eastern Sierra Land Trust. They are a respectable organization that works with land owners to protect vital lands and preserve a healthy balance of uses — from ranching to biking, wildlife habitats to favorite fishing spots — that can be sustained forever. The Eastern Sierra has always been considered a treasured resource by the team at Intervals, and we’ve committed ourselves to preserving its uniqueness.